The sixth sign of Virgo starts August 23 and ends September 22. It is the house of Service and health. This house rules the relationship you have with the people that you work with. 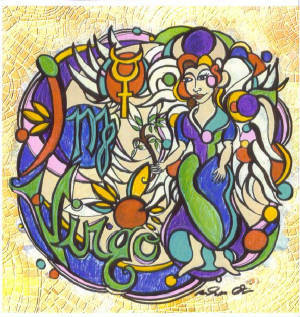 Virgo rules the nervous system and can show how you respond to pressure. Virgo natives like everything to be "just so". They are known to be the perfectonists of the zodiac. They usually choose something that they love and go for it with all their gusto. In order to get ahead it helps if they choose something that can reward them for their dedication, hard work and love energies. The PERFECT gift for the Perfect Virgo, a custom mandala. See My Products for details.